I left my posh accommodations at a decent hour this morning and got through the “traffic” in Spokane without incident. I was anxious to get to my new home, and promised myself I’d make as few stops as possible so that I could be productive today. I don’t remember much of the first half of this day. Looking back at my pictures, I see that the scenery was uninspiring and there were few interesting places along the way. I did stop at a rest stop in Washington state that served snacks and beverages for whatever donation you could manage for some local sports team or YMCA. What a great idea! I dropped a dollar in the jar and got a big cup of freshly brewed iced tea. I sipped my tea in the warm, morning sun before getting back in the car. Welcome to Oregon. Yes! It was raining, as predicted, but that was okay. The rain calmed the blistering heat, making outdoor excursions more comfortable. I stopped at the visitor’s center, located only after following a maze of signs off the highway. I gathered armfuls of books, maps and pamphlets about the Portland area. Only a few hours to go now. I was surprised to see how dry the eastern 2/3 of the state was. I drove and drove, watching trains, looking at fields dotted with power lines, reading road signs, and doing everything in my power to stay awake. When does it get green? *continue to support me as I fumble around in a new city trying to build a life. One thing I learned while undertaking this move is that I have an incredible circle of friends and family who are behind me 100%. Although I am now distanced geographically from many of them, I am determined to stay close to them all. Without you guys, I wouldn’t be the person I am today. THANKS SO MUCH! This entry was posted in Cross-country road trip, General, Oregon on August 16, 2006 by Jess B. Last night I stayed in a lousy, loud, bug-infested campsite so I was glad to hit the road. I was also glad that the train of ants that formed on the outside of my tent never made it inside to eat me alive. Today’s plan involved driving through southeastern Idaho, into Montana, and then back into the northern panhandle of Idaho. It was longer than taking the southern roads but it looked to be more scenic. Idaho was one two-horse town after another. I stopped in Dubois to get gas and a cold beverage. The gas station shop was a grocery store, deli, souvenir shop, hardware store, and everything else rolled into one. I probably could have bought a refrigerator there. It was huge. And it was the only vendor for miles upon miles. Driving was tedious so I looked at my roadmap to see if I’d pass through anything worthwhile today. I noticed some unusual museums in Butte, Montana, so I set on visiting there. The visitor’s center in Montana was staffed by useless teenagers who’d obviously have little insights to offer on the finer things in the town of Butte. I settled on grabbing a few pamphlets and maps before taking off to explore on my own. I had an hour to kill before the next museum tour so I went into a small cafe for lunch. The service was abysmally slow but the people were friendly and the food was reasonable. And, I had no choice. So I sat there, sipping a delicious blueberry- pomegranate smoothie while waiting for my lunch. After lunch I hightailed it to the tour company where I embarked on an underground history tour with 3 other folks and a guide. We were informed that years ago, Butte was a slammin’, prosperous party town rich on mining copper and other metals. Skyscrapers lined the streets, money flowed like water and people were always out and about. Today, there are remnants of the old times still visible to the average person but much of the town’s history is hidden underground. Today’s basements are located at yesterday’s street level, so many legitimate and illigitimate businesses are buried beneath modern sidewalks. Our first stop was a barber shop in the basement of one of the old buildings. The tour company had restored the barber shop to its 1950’s look based on accounts from aging locals. Our guide was extremely knowledgeable and enthusiastic, and had many anecdotes to share. During Prohibition, he said, barber shops were the place to go to get booze because the barbers could hide the bottles among the many bottles of shaving supplies they had on the counter. This barber shop had a hidden back room that doubled as a bar for certain, trusted customers. In fact, more men probably visited the shop for drinks than for a haircut. There was even a hidden escape door that led up to the street if someone’s wife came looking for him. Crazy. Our next stop was the Butte City Jail. The old one, shut down in the 1970’s. This place is in the process of being restored; some of it is still inacessible to tour-goers. Our guide told stories of police brutality, the “interrogation room” with three foot walls and no windows, the incarceration of Evel Kneivel, and repeat offenders who’d scribbled their names on every wall they could find. The jail conditions were putrid and inhumane; it’s amazing that it was only closed down 30 years ago. The final stop on the tour was in an old Speakeasy. This was a place for drinking, gambling, dancing, and other shady goings-on. The guide’s tales of life during Prohibition were vivid and interesting. There were secret passwords, one-way mirrors, hidden rooms, corrupt government officials, and much more. For someone who has no interest in history, this tour was really something. I was sad to be let out back to the modern day streets of Butte, which are far less vibrant and lively than they were in the 20’s. I didn’t want to leave Montana, with its beautiful scenery and cute little towns, but all good things must come to an end. I passed through Idaho again and drove on to Washington. I felt I deserved a nice night somewhere so I settled into a hotel on the outskirts of Spokane where I could take a nice shower, surf the web, and watch cheesy TV. I stretched out on the comfy bed and enjoyed my last evening on the road. Reality is going to hit hard very soon. This entry was posted in Cross-country road trip, General, Idaho, Washington on August 14, 2006 by Jess B. After yesterday’s hike I longed for something more challenging and satisfying. I inquired at the visitor’s center if any trails actually went to a peak. The girl at the desk recommended Static Peak, a mountain reached via Death Canyon. There was no official trail to the peak but she assured me a short herd path (which she called a “social trail”) would lead me to the summit. The trip would be just about 16 miles and a 4,000ft. -or so elevation gain. Great. At 7:15 am I started up the trail. Getting to the trailhead was an adventure in itself since it required driving up a long dirt road at a max speed of 15mph. There were several cars already in the lot, surprising for an early morning start at an out-of-the-way trailhead. I guess nothing is too out of the way in the Tetons. This trail was similar to the one I’d followed the previous day: flat, with lots of switchbacks. *sigh* Doesn’t anyone have a sense of adventure out here? I plodded along at a fair pace; I knew I had lots of miles to cover today and I didn’t get the 6am start that I’d wanted. I reached Phelps Lake and then went down into Death Canyon. “The prettiest in the park,” the girl mentioned. It was nice, but didn’t blow me away. The tall coniferous trees were set back in the canyon while narrow meadows of scrub and wildflowers lined the trails. The rocky canyon walls jutted up from either side of me, leading to steeper sections of trail ahead. Rounding a switchback and looking up through some trees I saw a large, black shape. I stopped in my tracks and carefully walked forward, eyes focused on this unexpected being. It raised its head and looked right at me. Oh sh……. Staring into the eyes of a large bull moose several yards up the trail was frightening. I’d never seen one without a fence separating the two of us. I’d heard that bull moose (mooses?) can be violently aggressive so I wasn’t sure if I should try and scare it away or sneak past. As I closed in on him, I realized the trail went right in his general direction. He obviously was aware of my presence and he didn’t seem to care. The moose munched away on the flowery vegetation just off the trail. I skirted right by him, breathless, trying to snap pictures without standing for too long in one place. Not far up the trail I encountered another group of hikers who’d had to bushwhack off the trail to get around the moose, who didn’t budge for them. Luckily the moose was in the shrubs when I arrived. I would see these hikers a few more times today. It took some time to get above treeline, something I didn’t get to do yesterday. Unlike in the Northeast, where the trees get noticeably shorter and more gnarly, there wasn’t too much indication that I was coming out of the forest until I was already there. The sun beat down brightly on the rocky ridgetop as I continued to climb. I was treated to lovely views of melting ice in the valleys below and jagged peaks in all directions. My steps became shorter and more forced. I’d like to say it was the elevation that was affecting me but I think it was just my own sloth :). I hadn’t done any big hikes in a long time. Along the trail, a tiny patch of snow glistened in the dirt. Instinctively, I reached down, scooped up a handful and rubbed it on my limbs, head and the back of my neck. I put a few clumps down my shirt for good measure. The cold snow felt so good on my overworked body. Upon reaching the Static Peak Divide, I saw Static Peak and the herd path leading to the bare summit. Soon, I lost the path and meandered slowly up the rocks. Looking behind me, I saw someone else with the same idea so I tried to hurry up. I was winded and tired but I wanted to arrive first. I found the herd path again, which led me to the top. The panoramic views of the surrounding mountains and bowls in addition to the feeling of conquering a peak created the sense of satisfaction I’d been looking for. I took off my socks and shoes, sat on the ground and soaked it all in. I chatted with the other hiker up there, a local who shared lots of information about hiking in the Tetons. It was still morning, but I’d been warned about freak lightning storms up here so I retreated after a half hour of relaxing. I happily bounced down the mountain and ducked below treeline all too soon. Back in the woods, nose to the ground, I moved along steadily. The wooded sections of trail were broken up frequently by stretches of grassy clearings. In one such clearing, I heard the sound of hundreds of grasshoppers or crickets leaping from plant to plant. Strange…I thought…until realizing that was the sound of heavy raindrops falling from the sky. I was miles out from the trailhead, with no raingear, and then I heard a loud BOOM. Thunder. Wonderful. The rain started coming down and I walked a little faster. Then I saw lightning and started to run. Being wet was no big deal, as I’d seen my share of wet hikes this past spring. But the thought of being struck by lightning was not appealing to me. For most of the next few miles I sprinted down the trail, pausing in the dry, wooded areas, and blasting across the clearings. I had been feeling the hurt of a long hike prior to this rain, but the adrenaline kicked in and fueled my rapid descent. Towards the bottom of the trail, the rain subsided. I encountered many, many groups of people, mostly decked out in ponchos and other rain attire. They must have been furiously hot in there. When I arrived back at my car, the lot was overflowing with cars. 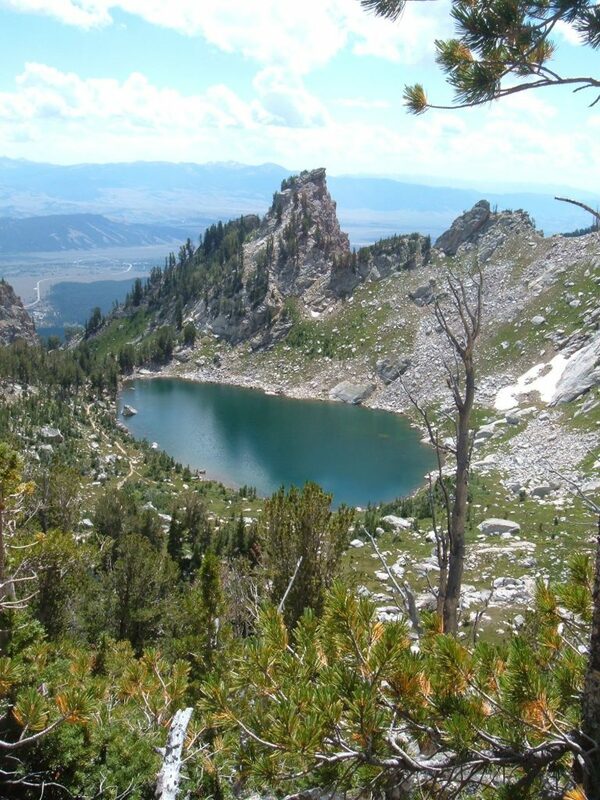 Most people make the 2 mile trek to Phelps Lake and call it a day. It was 3:30pm. I’d just cranked out 16 miles in just over 7 hours. Beat, soggy, hungry, thrilled. I saw a moose, several pika, some grouse, magpies, a marmot, and many unidentified birds. I’d gone above treeline, reached a summit, and battled the rain. This completed my exploration of the Tetons, as I had to get back on the road. I drove almost 3 hours today before stopping in Idaho Falls. Tomorrow, more driving. This entry was posted in Cross-country road trip, General, Hiking on August 14, 2006 by Jess B.
I arrived late this morning and didn’t get to the trailhead until 10:30am. Yes, this is late for me. With hesitation, I chose the “very strenuous” route up to Ampitheater and Surprise Lakes. This 9.6 mile out-and-back trip is popular, so it’s strenuosity was questionable. I was intimidated by the grandeur of these big, Western mountains so I planned for a tough day. To my surprise, I quickly ambled up the trail, reaching the lakes in about 2 hours. The trail was level and smooth, with tons of switchbacks, creating a slow and steady grade for its entire length. Surprise Lake comes first, providing impressive views of the peaks that encircle it. Several people were stationed around the lake, sunning themselves and enjoying the early afternoon. I sat and relaxed for a bit before proceeding to Lake #2. Ampitheater Lake was also very cool but also crowded with people. I’d heard and seen people all day and was dying to get a wilderness experience. The trail seemed to continue past the lake, so I followed it until it disappeared. The landscape cleared out and the rocks were too enticing to leave unclimbed. I scrambled around, peering over steep cliffs and eyeing massive scree piles. I looked to one nearby “mountain,” which may have been Disappointment Peak, and decided to try and get up there. The terrain changed from a woods-walk to a rock climb. I was alone, with no technical gear or expertise, and off trail. I didn’t ascend too far before I was too shaken up to proceed. I could pick routes up the rocks but I foresaw myself getting stuck up there like a cat in a tree. The side of the mountain dropped off significantly to my left and I couldn’t risk a fall. So I sat carefully on a small ledge, let my heartbeat return to normal, and retraced my path down the rock. Turned away by the mountain, my desire to climb a peak became much more intense, and I was determined to reach the top of something tomorrow. For the next 4 miles or so, that’s what I did. And it was fun! Towards the very bottom of the trail my legs began to feel heavy and wobbly so I walked the last few tenths of a mile out. It was really invigorating to run on the trail, which seemed much rockier now than when I had ascended. I noticed many of the finer details of the trail when moving at a much more rapid pace. As much as the trail was lousy for hiking, it was great for running. It was only 3pm when I returned to the car. In short, I completed about 10 miles in under 5 hours, which included some exploratory rock scrambling, lake admiring, picture-taking and trail running. It was hot and dry, and the trail was flat as a pancake, tilting up at a regular angle. More switchbacks than I can count! I’d check out the tourist pit of Jackson, Wyoming before settling in at the Gros Ventre campground in the Teton N.P. Tomorrow, I’d be in for more grueling hiking. This entry was posted in Cross-country road trip, General, Hiking and tagged hike366 on August 14, 2006 by Jess B. After a pleasant visit to Mt. Rushmore, I crossed over into the state of Wyoming and drove slightly out of the way to Devil’s Tower. I would surely get some use out of my National Parks pass on this trip! I hit some traffic coming through this way, as this is a popular destination. I was stuck behind many motor homes and cruiser bikes. When I was finally able to park, I exploded from the car and hit the trail that rings the base of the tower. The other trails were closed due to a high fire danger. I made my way around the tower, smiling at people breathlessly walking the trail, checking out the rock climbers,and eyeballing the talus slopes that looked oh-so-fun to climb. Around noontime, I hit the road for hours of driving. Wyoming was larger than expected, and I had to stop at several of the turnouts to rest, grab a soda, or stretch my legs. It’s crazy how driving through the heat of the afternoon, even with the A/C blasting, is extremely tiring. I know how dangerous it is to drive tired so I napped and recovered often.At 7pm I stopped at the friendliest little campground that ever existed. If you’re ever in Riverton, WY you must check out Owl Creek Campground. The old couple who ran the place were very helpful, the bathrooms were immaculate, and the campsites were relaxing. There was no cell phone reception, so there were no distractions. I listened to the birds and turned in for another night’s sleep. The highlight of today surely was hiking through the Tetons. That will be the subject of my next installment. Along the drive there, however, I passed through the town of Kinnear with a population of 44! I would also cross the Continental Divide for the first of many times on this trip. Stay tuned for more. This entry was posted in Cross-country road trip, General and tagged hike366 on August 11, 2006 by Jess B.
I awoke early and found that the Black Hills visitor’s center was not open yet so I had no information or maps to explore the area. Since I was so close to Mt. Rushmore, I decided to check it out. Let me preface this by stating I have a minimal interest in history and I deplore being in crowds. The appeal of visiting this famed National Monument wasn’t there for me. I knew I’d regret not even taking a look at it since I was so close, so, I took the quick drive over. As soon as I began the walk up to the viewing area I knew this was the right decision. It was so early that there were only a handful of cars in the parking garage and the gift shops were still closed. Workers were cleaning the terrace and getting ready for the onslaught of people sure to visit today. I wanted to walk around so I took the 0.6 mile loop trail down to the base of the mountain and back up to the main terrace. No one else bothered to walk this strenuous trail today so I had the place to myself. It was an amazing feeling to look up at the impressive carvings and to check out the mountain’s natural features. I was treated to a variety of wildlife, including chipmunks, mountain goats, and canyon wrens. My day was off to a good start. Next on the list: Devil’s Tower, Wyoming. This entry was posted in Cross-country road trip, General on August 11, 2006 by Jess B. So we chatted about my little Scion and he wished me a good trip. The bikers are out in force because the big bike rally is going on in Sturgis this week. I’d see quite the assortment of motorcyles, denim, leather and fringe over the next few days. At 11:30 I pulled into the small town of Mitchell to visit the Corn Palace I’d been reading billboards for all morning. It was a dreadful tourist trap but it provided a nice rest from all the merciless driving. I picked up some souvenirs, soaked in the sun and returned to the road. Speaking of billboards…for hundreds of miles I’ve been entertained by billboards advertising “Wall Drug.” Some are cute, some are funny, some are strictly informational and all are enticing. It must take some strong will to NOT stop there. It is still a ways off so I will have to check it out later. In the meantime, I crossed into the Mountain Time Zone and soon after, arrived in the Badlands. Gray clouds loomed large over the unusual landforms of the Badlands and almost as soon as I arrived, large bolts of lightning illuminated the area. Then, the downpour of rain began. I had been looking forward to hiking here for days! This was a disappointing turn of events. So I drove around for a little bit, admiring the contrast in colors and awesome rock shapes to wait for the storm to pass. Eventually the skies cleared enough to allow safe passage. I stopped at most of the turnouts and explored the brief side trails at each one. A few times I followed herd paths or made my own trails just to get a taste of the park off the beaten path. It was beautiful, but I couldn’t see myself spending lots of time here. I took some pictures and loaded myself back up into the car. Not far up the road I entered the town of Wall and drove to the world famous Wall Drug. The place was gigantic, with room upon room of junk to buy. I ate a Buffalo burger and fries and parted with some of my money, buying a hiking book and some souvenirs. A few hours later I decided I’d gone far enough. In the darkness of 9pm in the Black Hills, I pulled into a campground and slept in the car. Buzzing through the Eastern U.S.
225 miles later I pulled into a rest stop to stretch my legs fill up the gas tank, and hit the ATM. It was probably 95 degrees outside and very humid. Back in the car. The day continued this way for nearly 12 hours. Change the CD, grab a snack from the cooler, look around at the bleary scenery. Eventually the traffic thinned, the landscape flattened out, and I was nearing my first stop. Lucky for me I have a relative conveniently stashed near Cleveland, Ohio. She graciously took me out for dinner and let me crash at her place. This was a pleasant first night. 6:50 am and I’m back on the road. I’ll drive about 12 hours today. Well, maybe 13. I crossed over to Central Time before noon. Ohio, Indiana….uneventful. Illinois. TOLLS. Constantly. I was so annoyed at having to stop so frequently. Can’t they use a ticket system like every other major thruway? And the worst part was there were no signs indicating the price of the toll until you were at the tollbooth so you have to fumble around to accumulate the correct amount. What a ridiculous system. At last I escape that awful state and then reach miles of cornfields also known as Wisconsin. Driving here is mindless and sleep-inducing, but occasionally I was awakened by interesting buildings, low-flying planes, random rock formations and funny signs. I press on to Minnesota, which has the same scenery. I spend the night here and anticipate better things ahead in South Dakota. Driving, driving, driving… I write tonight from a hotel somewhere in Washington. I drove through Idaho, Montana, and Idaho again. I made one stop in Butte, Montana, where I had lunch, walked around a bit and went on an underground history tour. More about that later. This entry was posted in Cross-country road trip, General on August 7, 2006 by Jess B.
I’ve spent the last two days hiking around Grand Teton N.P. The trails are super easy but the views are just astounding. I’m glad I decided to make a pit stop here. Yesterday I hiked up to a couple of lakes and then ran back down to the trailhead. Yes, ran, the trails are like childs-play. Then today I hoofed it 8 miles up to Static Peak and 8 miles down. Along the way I saw a moose, several pika, a marmot, lots of birds I have to look up in my book, and plenty of butterflies. After my glorious adventuring I drove west a bit and I’m camping out…somewhere west of the Tetons 🙂 I have plenty of time to get to Portland so who knows what interesting stops I’ll make along my way. This has been a wickedly exciting trip. I don’t want it to end! Oh, and if you’re hungry for more pictures, you’ll just have to wait. I have hundreds of them to sort through once I reach my destination. Trust me, it will be worth the wait. This entry was posted in Cross-country road trip, General, Hiking on August 6, 2006 by Jess B.